Have you ever heard of Tropicana Juice rewards? I read about it over at hip 2 save and just had to share it with all of you!! They are offering up yet another awesome reward and it is valid today ONLY! 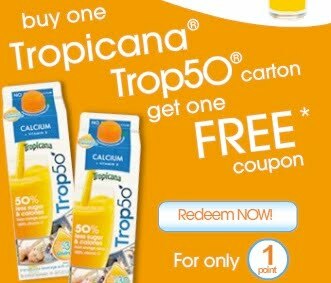 From now through November 15, 2010, each specially-marked Tropicana, Tropicana Pure Premium and Trop50 product will include a unique 10-digit code with each code being worth the Juicy Reward Points stated on the package. Earned rewards include discounted admissions to amusement parks, museums, zoos etc. ; to explore all of the available rewards in your area, click here. In order to get started, you must first register at Tropicana by clicking here (you’ll get 1 point just for completing a quick survey!). You can then enter your codes at Tropicana.com or via mobile phone by texting the code to TROPOJ (876765). After you’re registered, you can redeem a buy one get one FREE Tropicana Trop50 coupon (up to a $4.99 value) for just 1 point– valid today, April 7th ONLY! To score a point to print this high value coupon, enter code LA73E CL9W4. After doing so, go here and click on the “Redeem Now” button on the lower right hand side. You will then immediately be able to print your coupon. Press your browser back button to print a total of 2 coupons!